Then she made...: Road Trippin' T'shirt pillows! We are road trippers! I love to hop in the car and just drive and explore. I love it. And, lucky for me my kids are good travelers and like it too. They will, like most kids, usually fall asleep at some point in the journey, though. You know, heads bobbing, drool, and eventually necks kinked at 90 degrees. It looks so uncomfortable. You know what I'm talking about, right? Well, one thing that makes them a little more comfortable is a t'shirt pillow. I'm sure you've heard of them. I made my first one in 2000 prior to a 3,000 mile journey across the US. My oldest daughter was only 3 at the time. It worked wonders. She was never a blanket kid but has always loved clothes so when her favorite t'shirt got to small we turned it into a pillow and it worked like a charm. She was comfortable on the drive and had something familiar with her, too. 2- Lay the shirt out flat and you are going to sew closed all the places where the arrows are pointing. I usually start with the neck, line up the front and back and pin it. Then I sew it. Next I do the sleeves and then the bottom. On the bottom only sew about 1/2 of it closed. You need to leave an opening to add the stuffing. The photo above shows the neck and one sleeve sewn closed. 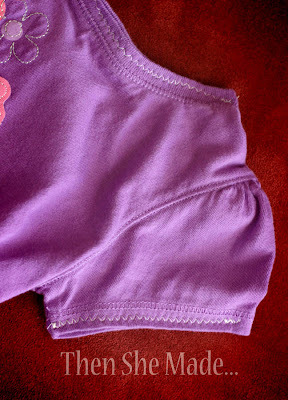 I just use a zig-zag stitch but any stitch will work. 3- Next start adding your fiber-fill. The trick to adding it is to keep the wads soft and loose. Don't ball it up and then stuff it or it will make your pillow look bumpy. 4- When you are adding the fiber-fill, push it into the sleeves first, then up near the neck of the shirt and finally the rest of the body. 5- When you have it filled to your liking, stitch up the opening and believe it or not, you are done! 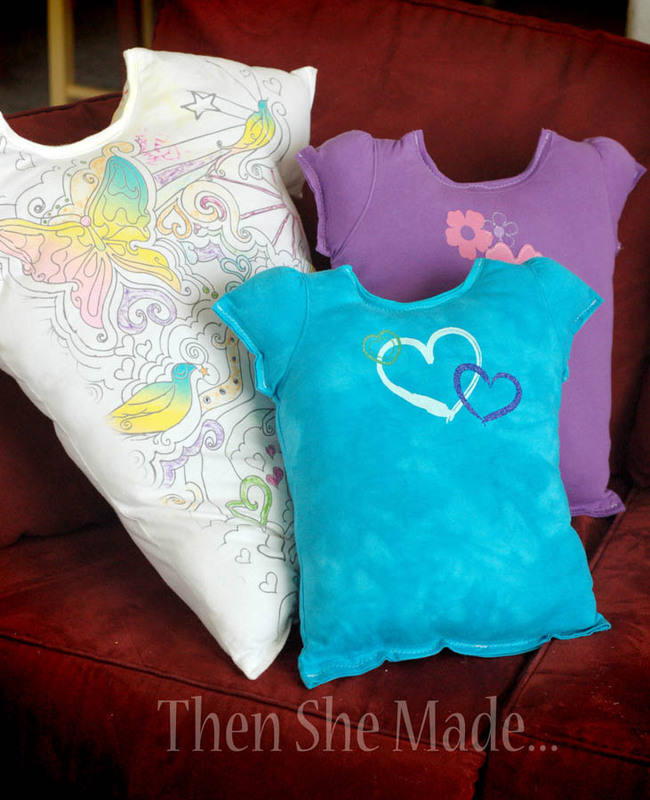 Have your kids help and let them either make it themselves or have them paint and decorate it with fabric paints. 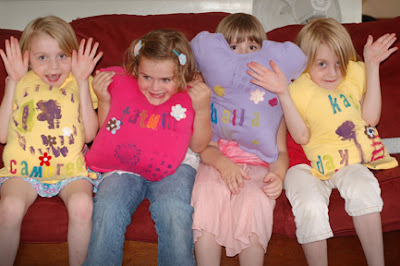 I held a craft camp a few years ago and we did just that, the kids LOVED their creations. 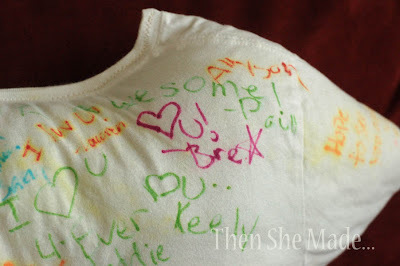 And, last year, on the last day of school, my teenager took sharpies to school and had all of her friends sign her shirt. 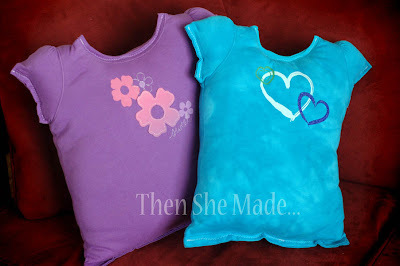 Then we turned it into a T'shirt pillow as a keepsake for her. 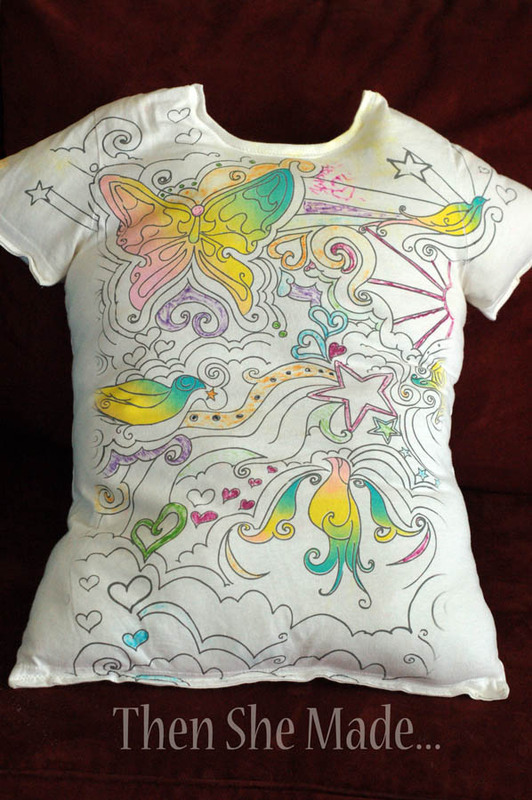 With school coming to a close this would be a fun thing to let your kids do and then they could make their own pillow. So there you have it! Simple and useful. Two of my favorite things. Awesome Idea !! I Love It !! I'm always wanting a smaller pillow for car travels. 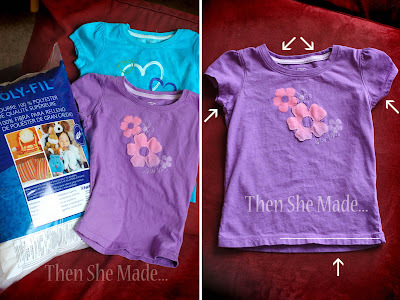 I made one of these lastnight out of my daughter's stash of outgrown tees. It's perfect! Thanks for sharing! I love this idea! I just made a few of these for a friend's children. I used quilt batting, the really fluffy kind and cut out several layers in the shape of the shirt.